We have a shared side driveway in front of our garage. 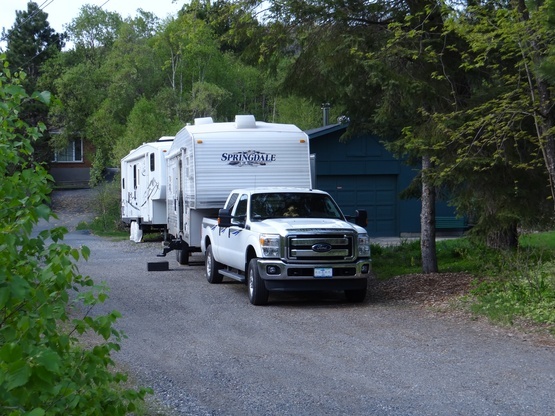 It is wide enough for an RV to park while still allowing our neighbour to enter and exit. We have room for a 45' unit, but you must be able to back in. I back in my 30' fifth wheel with no problem. No loud music. No generators after 10 pm. The road on which we live is paved, but has numerous hills and curves. The pavement is rather bumpy, but not too bad. Tow vehicle can be parked behind or in front of rig on our side driveway. We are home most of the summer, but do spend some week-ends with family out of town. Send us a message to see if we have a spot that fits your schedule. We have a science centre - Science North with an associated Imax theatre which are worthwhile visiting.There is a nice walking path around the shore of Ramsey Lake which is where the Science Centre is located. We also have a great park only 5 minutes drive away called Kivi Park. There are hiking and walking trails through nice forested land with both flat and hilly terrain. Lovely Lorna and I stayed here while making a run from Peterborough, Ontario to Pancake Bay Provincial Park as part of our Magnificent Adventure - 2018 - #MAG2018. Our hosts a retired educator and a retired geologist invited us into their home after we arrived and settled in making our one evening pleasant indeed. We spoke of many fine RV events and notions related to our nomadic lifestyle and will visit again when up this way. Be safe: have fun: don't hurt anyone! Doug and Linda have accumulated many 1000s of miles (kilometres) in travel through the USA and Canada. They are exceptionally generous and suggesting locations for our future campsites and places we can find usual experiences, such as Rock Hound State Park in NM. Developing a dialogue with them matches one's expectations for very experienced hosts. They were terrific, and we only regret that because of our schedule, we did not arrive before 7:00pm. Their location is accessible and very quiet. Doug and Linda were very hospitable hosts. They gave us a tour of their beautiful garden and told us the history of mining and smelting in the Sudbury area. Not only was this a very quite area, but also an easy on/off from the main road. Doug and Linda were great hosts. We spent an enjoyable evening visiting with them. They are very experienced travellers and shared their knowledge and experiences with us. We planned on visiting the Big Nickel and they even printed out a map for us to avoid road construction. Thank you for everything. We enjoyed spending time with our hosts in a beautiful neighbourhood near Sudbury. They were very gracious, and we had fun exchanging stories about our RVing adventues. Doug & Linda we’re supper host. They have a beautiful home in a Very quite neighborhood with easy RV accommodations. We had a nice visit and they were very helpful with directions and information about their city. Thank you Doug & Linda it was a pleasure meeting you both. Also thanks for sharing your delicious veggies from your garden, yummy. Great hosts... and willing to share some great RVing knowledge! Generous folks willing to help others along their journey. Very easy to get to from the Trans Canada highway. I certainly recommend staying with Mister50! This location all around Sudbury is very pretty & worth returning to. 2 days is not enough. The city of Sudbury is much bigger than I expected at approximately 155,000+ population. The host Doug is a great guy &'is willing to assist & advise you of things to do or see. did not coincide. I am certain she is an amazing Lady. Doug & Linda both enjoy sharing their wonderful location & are great hosts. I highly recommend this spot. We were greeted upon arrival and invited into their home after dinner. Was great to get their advice on travels by rv as they have been doing it for many years. Close to Sudbury and great hiking/biking trails. Lovely couple, would certainly go back if in the Sudbury neighbourhood. Wish we had the proprty to host as it is a great wsy to make new friends with a common interest. Thanks again. There are times in life when you meet someone and the moment is instantly magical. You feel like you have known these people forever, and you are instantly friends for life. Such was our encounter with our host ‘Mister 50’. What a delight. Wonderfully warm people. We were greeted as we pulled up, and they quickly helped us get backed in and set up. Everything was exactly as described, and they were very quick to return phone emails. They have promised to visit us next year, and we are already excited about their upcoming visit. We stayed two nights with Mister50, and also when we didn't meet for long discussions because we all were busy, they gave us some informations and tips. thanks for the good spot and enjoy your summer. We stayed one night at Mister50's place. Excellent host. Very easy to access their place and good parking spot. After dinner we had excellent discussion about everything... I am not a fine art expert, but I can tell you that he creates outstanding pictures, very talented painter (trust me much better than me...!). We really enjoyed their company and great conversations about travel. Nice quiet location, we slept well! Hopefully we will meet up some time during our travels. Very friendly hosts, informative about the area. Perfect site for a nice night to relax. Very welcoming and we'd love to visit again. Thanks! Our hosts in Sudbury welcomed us into their home for tea on a cold evening. We talked for hours about our travel experiences and had a great time. They are welcome to stay with us anytime. Thanks to Doug I was able to find his place without any problems. He and his wife were great hosts and had a good place for me to park. Staying with Doug and Linda was our introduction to Boondocking.... it couldn't have been better. They welcomed us very graciously into their home and gave us some good advice about what to see on our road trip. I would certainly recommend Mister 50. We stayed here for a night last week. Large driveway to back into. 15amp electricity was offered. We had a wonderful evening in their home.We highly recommend this place for boondocking. Easy to find,close to highway. This host has 8 other reviews.